Hip replacement systems allow many people to continue to enjoy an active and healthy lifestyle following serious injuries or the development of conditions such as rheumatoid arthritis or osteoarthritis. Systems such as Wright Medical’s CONSERVE line of metal implants with its Profemur Z Stem have done patients more harm than good, however, and those who have been injured or required revision surgery shortly after receiving their implants are now seeking compensation for their injuries. 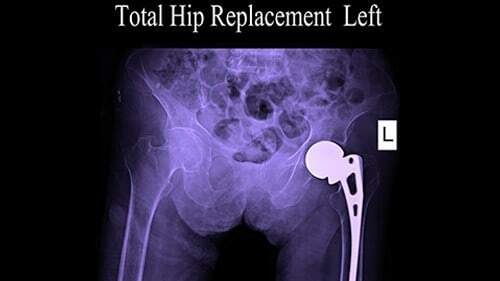 The Chicago hip replacement injury attorneys of Rosenfeld Injury Lawyers LLC are currently helping clients whose injuries resulted from receiving a defective hip replacement and can help you recover the full amount of compensation to which you are entitled. The CONSERVE product line is not the only metal on metal hip implant line to receive scrutiny over numerous complications arising from the grinding of metal components against each other inside of the body. It is the Profemur Z Stem that contains metal on metal components and poses significant risks to patients receiving these devices, as the heavy metals contained in the device can cause damage to the joint and following tissues when metal shavings are created though repetitious grinding. These same metals can cause a condition called metalosis, in which the victim is poisoned due to the accumulation of these metals in the blood. Like other metal on metal devices, the Profemur Z Stem is also prone to early failure and carries an added risk of fracturing the femur when the neck of the device breaks. Victims who suffer serious complications may ultimately require multiple revision surgeries and the regular monitoring of their blood for early signs of metal toxicity. Metalosis is a serious condition that can have debilitating effects, which include the following. The loss of the victim’s sight— in some cases, patients experience changes in their vision which can be corrected through the use of prescription eyewear while others are not as lucky. Metalosis can result in permanent blindness in some patients. Hearing loss— patients may suffer from diminished hearing or lose their ability to hear altogether due to metal poisoning. Tissue death and infection— metal shavings can cause scar tissue to build up within the hip joint and destroy surrounding tissue. This may lead to infection or necrosis, which is the death of the muscles and tissues in the area surrounding the joint. Neurological conditions— many victims of metalosis suffer from diminished cognitive functioning and may lose the ability to concentrate, recall past events, communicate effectively or maintain motor control. These conditions can be catastrophic and permanently alter the quality of the patient’s life. Heart disease or failure— metal toxicity may lead to the development of cardiomyopathy and other cardiovascular diseases. In the worst cases, it can lead to heart attack or death. Numerous plaintiffs have brought lawsuits against Wright Medical for failure to disclose the risks associated with the CONSERVE Plus and Profemur Z stem product lines. In Australia, it was reported that one in every nine patients implanted with the devices required revision surgeries, leading to the removal of the products from the Australian market. In the United States, Wright Medical has already settled multiple lawsuits before they could go to trial out of fear of mass litigation. Wright Medical has been subjected to numerous fines and unfavorable judgements after similar products caused injuries in patients. The Profemur R line was also found to be defective in a recent ruling made in June of 2015. Patients who have been injured following implantation of the Profemur Z Stem are still coming forward and litigators expect the lawsuits to form into a class action in the near future. It is important that you understand your rights if you have been injured after receiving a defective hip replacement product. You may be able to recover compensation for the cost of your revision surgeries, your out of pocket expenses and the court determined value of your pain and suffering. Our Chicago hip replacement defect lawyers are aware of how the latest legal outcomes may impact your case and are happy to review and discuss all of your legal options with you in the comfort of your home. Rosenfeld Injury Lawyers LLC is a leading personal injury law firm in Chicago that has helped thousands of people injured due to the negligence of medical product manufacturers. We have a special legal team dedicated to taking cases related to Wright Medical’s CONSERVE and Profemur Z Stem products who have extensive knowledge and experience with similar cases. Contact us today to arrange a risk free and confidential consultation with one of our award winning Chicago hip replacement injury attorneys. Once we have collected all of the information we need to investigate your claim, we will let you know more about your chances of recovering compensation and what steps we would recommend taking to pursue your claim. Our attorneys work on a contingency fee basis, which means we offer our services with no risk to you and will only accept payment upon securing the compensation you are entitled to on your behalf.